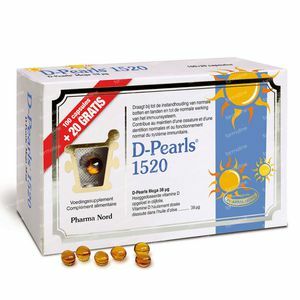 Pharma Nord D-Pearls 1520 + 20 Capsules For FREE 100+20 capsules order online. D-Pearls are soft gelatin capsules with vitamin D3 in each capsule. Their size makes them easy to swallow. The vitamin D is dissolved in cold-pressed olive oil, as vitamin-D is a fat-soluble vitamin. -1 capsule daily, unless otherwise advised. Preferebly with a meal. For adults only. Do not exceed the recommended daily dosage. -Pregnant and lactating women and users of drugs, should consult a doctor/specialist before using this dietary supplement. -Not suitable for children under the age of 10. -For maintaining good health is a healthy lifestyle and a varied and balanced diet is important. D-Pearls 800 : Olive oil, gelatine, glycerol, cholecalciferol (Vitamine D3). -Dark, dry and at room temperature. Keep out of reach of young children. -Seniors and people with dark skin are recommended to take ekstra vitamin D.
-An older and colored skin is less able to generate vitamin D3 from sunlight. -Dietary supplements should not replace a varied diet.